The Best Mustang Drift Racing You Have Seen! - Muscle Cars Zone! There have been some utterly awesome car videos we have seen lately where people do amazing stuff and stunts with their vehicles, but this Mustang drift racing is the best one you have seen after a long period of time. 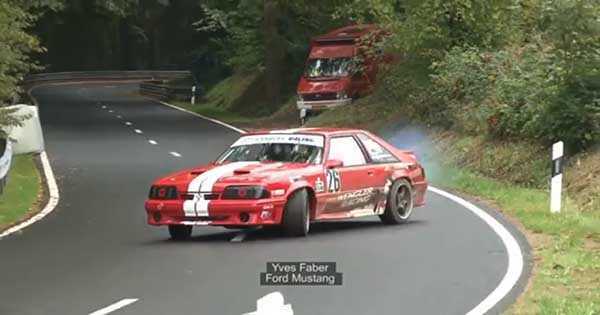 If you thought that racing cannot get any more exciting, you were most certainly wrong and this mighty old school Mustang proves that you can race while doing other awesome stunts at the same time. We get to see some awesome footage from a driver who thought that racing in a straight line was fairly boring and decided to use a little twist in it i.e. drift and race at the same time. Yes, it can actually be possible and this guy with his Mustang is a master when it comes to such driving. Though the video is fairly short and we see this Mustang drift racing only at a small fraction of the whole track, it is surely enough for us to grab the main idea of how it actually looks like. It takes tons of skills and experience to perform this stunt hence even the slightest mistake might cause the car to crash in the fence besides the road. Luckily this does not happen and we see this master doing his job perfectly while at the same time amusing the people there and offering them a chance for a little laugh. What do you think, how much practice does it take to actually be able to do this? Finally, check out the top 10 Drift cars!